On Episode 135 of CrossFit Radio, host Justin Judkins interviewed Laurie Carver, who won the Masters Division at the 2010 CrossFit Games. Justin also interviewed CrossFit strongman Rob Orlando. This episode was webcast live at 6 p.m. PDT on Wednesday, Sept. 1, 2010. 9:45 CrossFit Games Masters champion Laurie Carver came on the show to share her thoughts on the weekend at the Home Depot Center. She talked about how she prepared for the Games this year and described her athletic background and her daily schedule as she trains people at Northwest CrossFit. Not content to rest on her laurels, Carver is preparing to compete at sectionals in the 2011 Games season. 30:10 Rob Orlando is a busy man these days, but he found time to come on the show to talk about all his projects. Not only does he own the successful affiliate Hybrid Athletics, but he’s also going to start presenting Strongman Seminars around the country. Rob explained why CrossFitters should use strongman exercises and how they’re beneficial, and he went on to detail the ups and downs he’s experienced as an affiliate owner. Rob is also preparing for the CrossFit-USAW Open coming up in October in Colorado Springs. 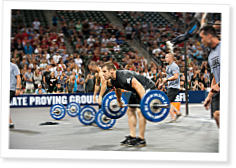 He gave his thoughts and impressions on the hybrid competition that will see CrossFitters competing in a judged Oly-lifting event and a triplet. On Episode 130 of CrossFit Radio, host Justin Judkins interviewed the World's Fittest Male, Graham Holmberg. This episode was webcast live at 6 p.m. PDT on Wednesday, July 28, 2010. If CrossFit makes a strongman cert---I'm in. We are looking at adding all the strongman stuff to our gym. Great job and interview.